In fact, I can be a little bit crazy when things are disorganized. Admission time: I’m so crazy that I organize my clothes pins on my clothes line by type and color. Yea, just a little bit crazy! I have a typed family schedule on my wall. A goal chart in a sleeve protector that I can erase and fill in as I go. My books are organized by fiction and non-fiction. My kids’ toys are organized by type. I do believe that my family I function best when things are organized and everything is neatly in its place. However, if I organize my temporal life and fail to organize my spiritual life, I have failed in one of the most important areas of my life. 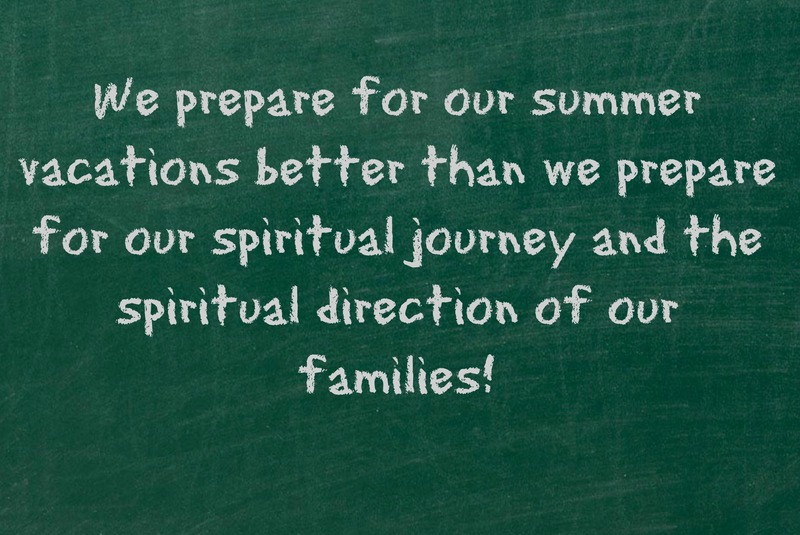 We prepare for our summer vacations better than we prepare for our spiritual journey and the spiritual direction of our families! Have you ever taken a moment to map out your spiritual goals? 1. What are my strengths? 2. What are my weaknesses? 3. What sin do I regularly battle with? 4. What are my spiritual goals for the next 6 months? 5. What are my spiritual goals for 2014? 6. What are my spiritual goals for the next 5 years? 7. What are my spiritual goals for the next 10 years? 8. What ministry do I feel called to? 9. Where would I like to serve in my church? 10. List 3 women I feel I trust enough to hold me spiritually accountable. Once you have answered these questions, find 2-3 verses that deal with answers #2 – #7 and commit them to memory. Commit #8 to prayer and begin actively pursuing that ministry. Immediately begin preparing to fulfill #9, if you haven’t already. And then contact the three women you listed for #10 and ask them to hold you accountable. Prepare a list of areas that for which you would like them to hold you accountable. Be sure to note that at any time they should feel free to ask you where you are presently reading at in the Bible, how many days each week you pray fervently (not while doing chores or over your meal, but intentional prayer time), if you are actively memorizing God’s Word and if you have violated God’s commands or you conscience in any way. By following this format, you will have spiritual goals set before you. Lastly, commit to organizing your personal and family’s temporal activities in such a way that they lead you – and not distract you – to your goals. If you feel called to the mission field, now is not a good time to purchase a home or take out a car loan. If you feel your children should become more involved in church activities, perhaps involving them in year-round sports activities is not a good idea, as this will likely keep them out of church on a regular basis. Spiritual growth doesn’t just happen. Our relationship with God needs as much care and investment as any other relationship in our lives. Yes, Jesus did all that was necessary to open the way to the Father. The path is set before us. However, the journey is up to us. We must plan. We must prepare. We must be intentional. 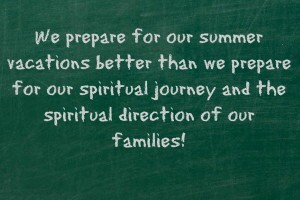 We should plan our daily activities intentionally to be in conjunction with where we are going spiritually. Because this is the most important journey we will ever take! It truly was a great post! I’m so thankful for Rosilind’s posts here each month, she is an inspiration! Thank you for stoppin by! Blessings! Kathy – thank you. I got this idea from my dad several years ago. And that quote, something my mom once said, has stuck with me. They were so great at this intentional aspect of our “family vision” – and the rewards are there…with 3 kids now in full-time ministry – raising up a new generation. I was so excited to be able to pass on this very important – but often overlooked – aspect of organizing our spiritual lives. I am so glad you found it helpful! Blessings! !